The 12th annual Boat Race featuring the top men’s and women’s crews from Queen’s and Trinity College Dublin, will set off from the University’s ‘new look’ Boathouse this Saturday, 11 June. The refurbished Lagan landmark, which has recently been refurbished at a cost of £1.2m, has been home to Queen’s Rowing Club for 65 years. The Boathouse now offers a world-class facility for Queen’s rowers and includes a floating pontoon, as well as purpose-built storage for the University’s fleet. 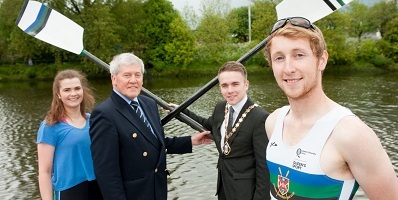 Competitors from across the island of Ireland, including crews from Methodist College Belfast, Portora Royal School and Royal Belfast Academical Institution, along with Bann Rowing Club will also be competing on the day. Speaking at the launch of this year’s Race, Liz McLaughlin, Head of Queen’s Sport, said: “The opening of our new Boathouse is set to add further excitement to our 12th annual University Boat Race, as the crews will now launch and finish from this point, offering fantastic viewing opportunities for spectators. “This investment is further evidence of Queen’s commitment to ensuring its students and the local community continue to have access to world-class sporting facilities. The University would like to sincerely thank the Belfast Boat Club for allowing students to row from their facility while our Boathouse was being refurbished." Trinity College Dublin are the current champions and the 2000m long course is a popular event in Belfast’s sporting and social calendar. Last year more than 2,000 people lined the course to support the crews, and it is expected that, once again, the towpath and bridges will provide viewing points in addition to the new facility at Queen’s Boathouse. and rear function area. On offer will be lunch, table service and live music. Tickets, costing £25 can be purchased from Queen's Sport Reception in the PEC, by telephoning 028 9068 1126 or by emailing boatrace@qub.ac.uk. For media inquiries contact Queen’s Communications Office, tel: 028 90 97 3091.